Hope you are all doing good. Another new week has started and you must all be busy in your work. In my office, I have so much work lined up for the week. But then I can’t ignore my beloved blog, right? So here I am with another product review 😀 Most of us suffer from troubled skin – breakouts, blemishes, pigmentation, tan, etc. I myself have all these issues. But ever since I have incorporated Suganda products in my skincare routine, I have seen a remarkable difference in my skin color, texture and other issues. So this is the routine I follow everyday → cleanse with Suganda Neem Green Tea Mask, follow up with Suganda Anti-oxidant Serum and then Suganda White Lotus Moisturiser. 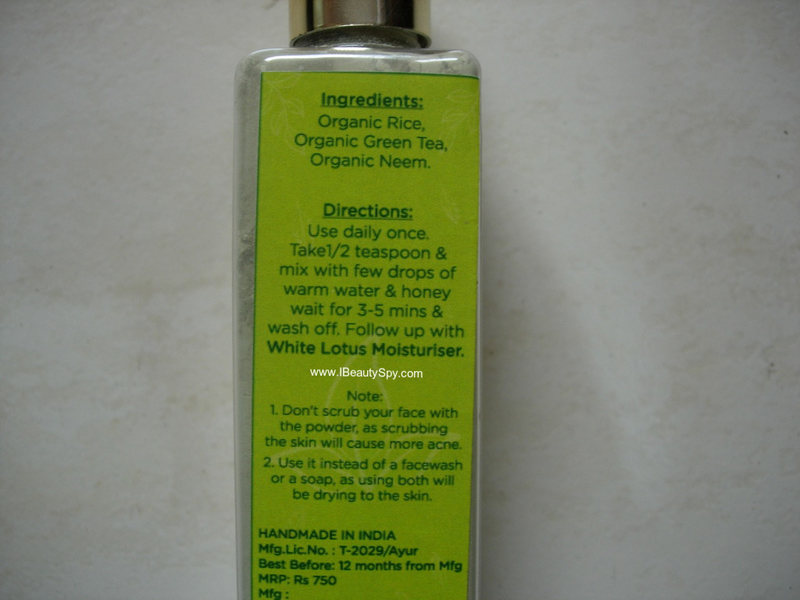 I have already reviewed Suganda White Lotus Moisturiser in the given link. You can check it out as its a wonderful calming, oil-free moisturizer for sensitive, acne-prone skin. Today let’s see how Suganda Neem Green Tea Face Mask works. 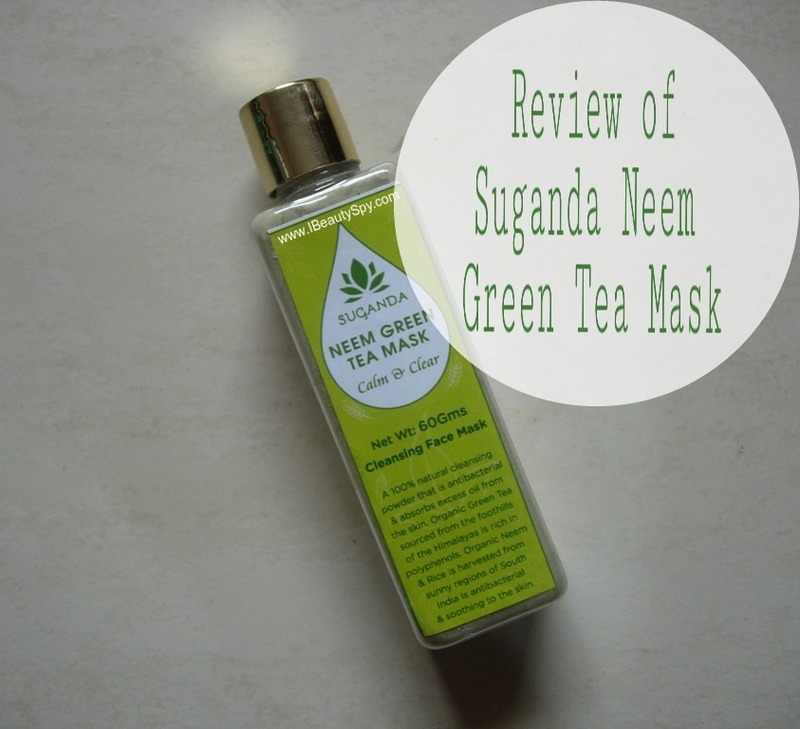 I have already reviewed Suganda Neem Green Tea Mask long ago in my blog here. But I wanted to update my review with my current experience. So reviewing again now. 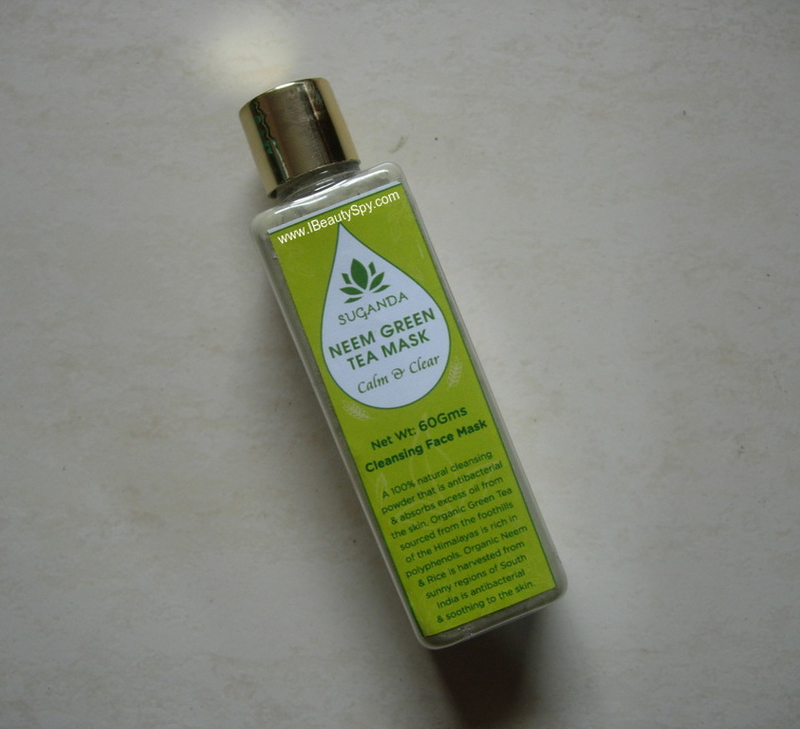 Suganda Neem Green Tea Mask comes in a tall plastic container with a screw cap. This is so much better than a tub packaging for face masks. 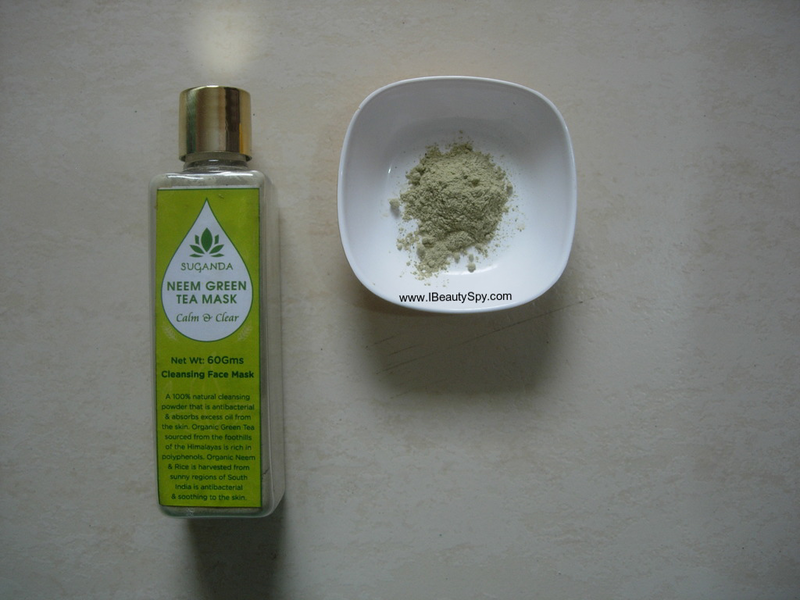 Suganda Neem Green Tea Mask is in powder form and looks light brownish in color. However once you mix with water, it turns green in color. The powder is not very fine, not very granular, medium texture. It has a refreshing mix of neem (slightly bitter) and rice flour scent. I love to use the mask just for this refreshing natural smell. 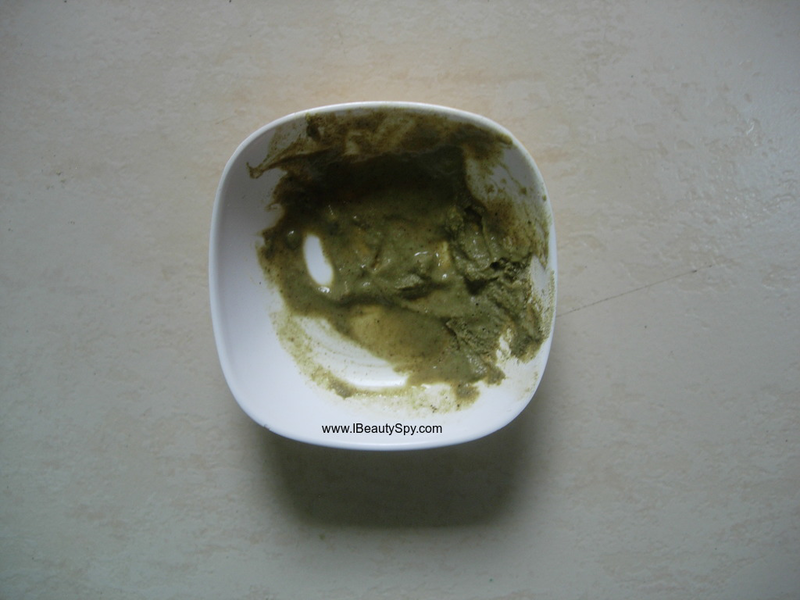 Suganda Neem Green Tea Mask is a 3-in-1 product and can be used as a cleanser, scrub as well as mask. For using it as cleanser or scrub, I mix with water. For using like mask, I mix with curd. My favorite is using it like a face mask. I apply a thin layer of the mask on my face and leave on for around 15 minutes till it dries up. And then I scrub a little and wash off. Results are: clear and refreshed skin. Deep cleanses skin, removes clogged pores,whiteheads and blackheads. Also controls oiliness. Removes tan and brightens skin visibly due to presence of rice flour. Long term results are helps reduce pigmentation, subdues and prevents acne. I have used it on a new pimple which was just about to come and it subdued the pimple completely the next day. I have also used it on a mature pimple, and in that case it takes around 4 days for it to completely subdue. I also used it as a body scrub and it works great that way too in detoxing skin and removing tan. I love Suganda Neem Green Tea Mask for its cleansing and purifying properties as well as removing tan and brightening skin. This is a great natural, organic face mask suitable for all skin types. If you live in a polluted city or travel in pollution a lot everyday, then this is ideal to deep cleanse and purify your skin. * Green tea contains Epigallocatechin Gallate which has skin repair qualities and more potent than most skin-nourishing vitamins, vitamin C, and vitamin E.
* More recent studies on acne tell that curing acne with antioxidants is much beneficial. One of the main causes of the blocked pore (a single acne) is sebum oxidation. Oxidised sebum is sticky and hence dead skin cells instead of leaving skin stick to the skin and block pores. So adding antioxidants to your skin will reduce sebum oxidation. * 100% natural, organic, and clean ingredients. * Cleanses, purifies and refreshes skin. * Clears clogged pores, gets rids of blackheads and whiteheads. * Removes tan and lightens skin. * Subdue and prevent acne. * Great for those who are exposed to pollution everyday as it purifies pores. 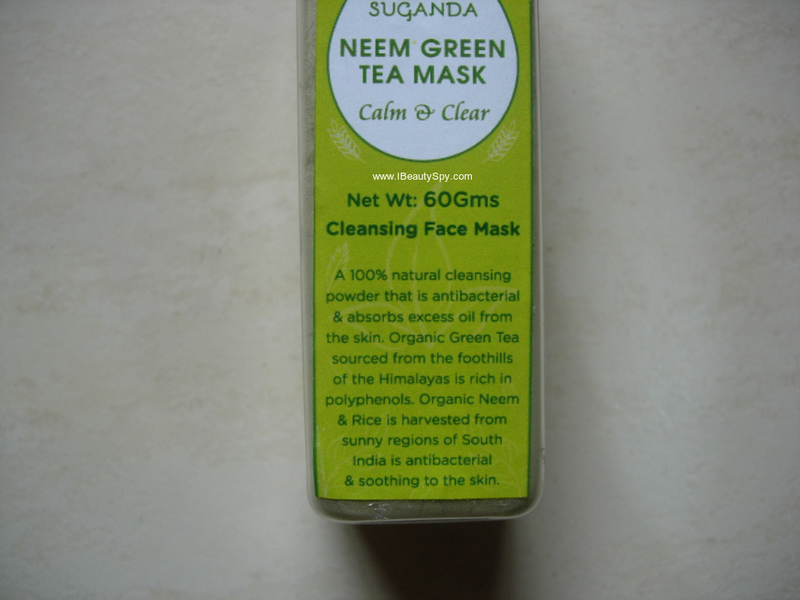 Suganda Neem Green Tea Mask is a clarifying face mask which will give you calm and clear skin as desired. I find it highly ideal in our current pollution environment. Pollution does take a toll on our skin and this mask helps to deep cleanse and detoxify skin as well as the antioxidants repair the skin damage. It has simple, minimal, clean and effective ingredients list. I just find it slightly pricey. But it has 100% organic ingredients. You can definitely give it a try once. The reason I love your blog the most is because I get to explore new brands and some amazing products in addition to getting honest reviews..